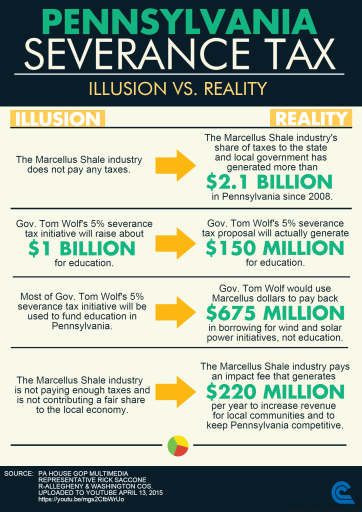 Severance tax illusions seem to be the order of the day in Pennsylvania today among many politicians, but there are some who, thankfully, grasp the realities. Recently, Pennsylvania State Representative Rick Saccone released a video talking about the Severance Tax Proposal along with the hard facts of what it would mean for the industry. The Saccone video clocks in at roughly 10 minutes and takes viewers through an easy to understand discussion on the natural gas industry and the current severance tax proposal. Editor’s Note: It doesn’t get much more clear than this, does it? Rep. Saccone’s video statement is unusually blunt for an elected official and speaks to the importance of natural gas development to his district, something he’s obviously determined to protect. He lays it all on the line with refreshing candor. Please take the time to watch the whole thing. It didn’t take long for the Wolf in sheep’s clothing to show his colors. He’s frightfully unfit to be the governor of Pennsylvania, or any state, to say the least. He should be shipped up to New York State with his mentor, Rip Van Cuomo a.s.a.p.